To Stew a Knuckle of Veal (162) Take a knuckle of veal, chop it into pieces and Season it with pepper and Salt. Lay the bones at the bottom of the pan, put the meat upon them, pour in two quarts of water, let it simmer till it becomes one, Some Sweet herbs must be put in with the meat. Thicken the gravy with flour butter and nutmeg. Put the herbs in a thin cloth. - Pickle for Ham, Tongue, Beef and Mutton. 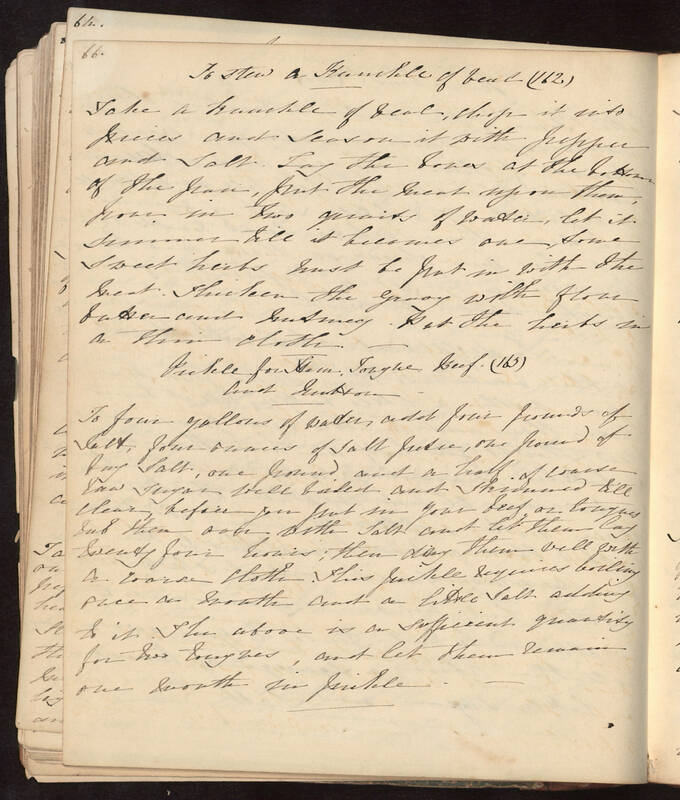 (163) To four gallons of water, add four pounds of Salt, four ounces of Salt petre, one pound of lump Salt, one pound and a half of coarse raw Sugar well boiled and Skimmed till clear before you put in your beef or tongues rub them over with Salt and let them lay twenty four hours; then dry them well with a coarse cloth.This pickle requires boiling pace a month and a little Salt adding to it The above is a sufficient quantity for two tongues, and let them remain one month in pickle.